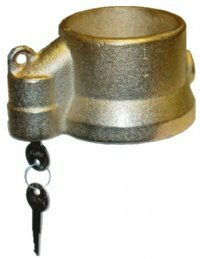 The economy kingpin lock offers a closed bottom design for added grease control and easy install. The closed design keeps the grease contained within the lock and off of the installer. The economy lock is installed using only the key, no installation tools are required. Increase the security of a parked trailer significantly by using a kingpin lock. For added security use in conjunction with other security devises or for the ultimate security kingpin lock use the Trailok High Security Lock.